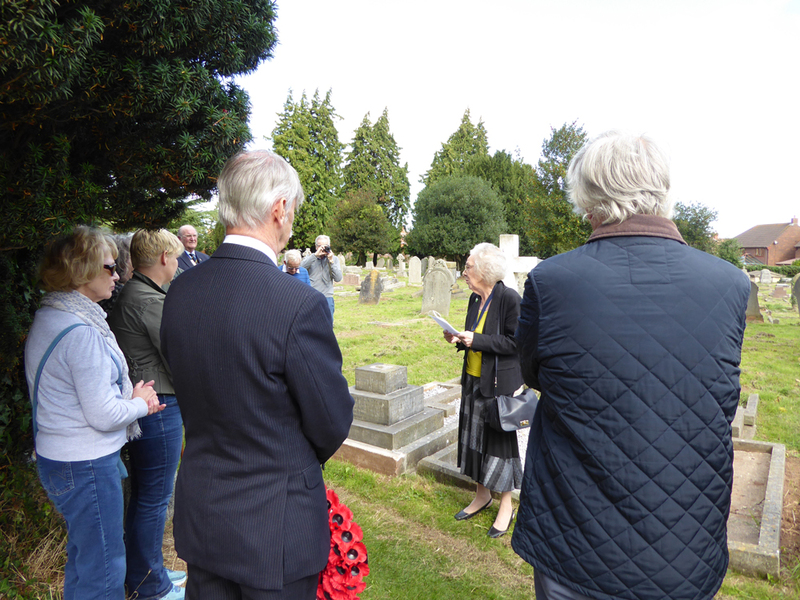 On Friday 7 September the Friends of the Wembdon Road Cemetery held an event to commemorate one hundred years since the end of the First World War. 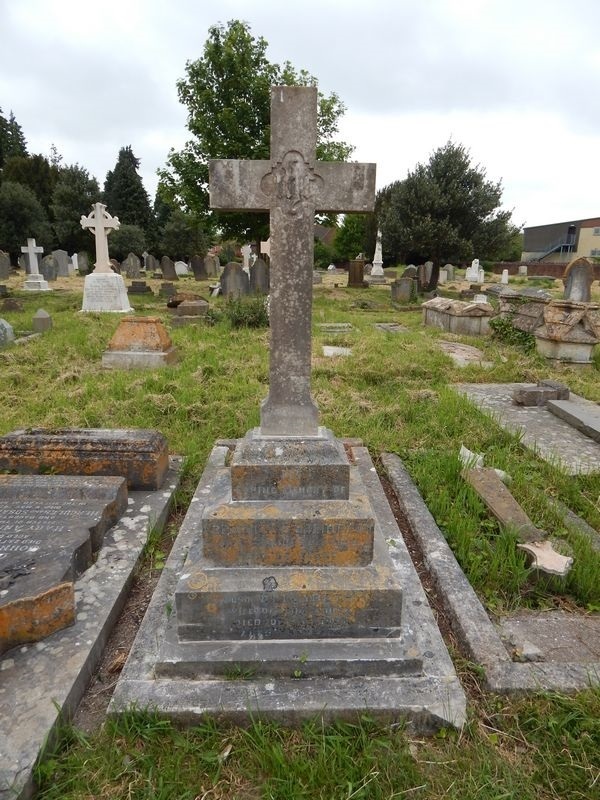 There is a total of 56 First World War related memorials in the cemetery; 28 Commonwealth War Graves for men buried in the cemetery and a further 28 remember Bridgwater men buried on the battlefields where they were killed. 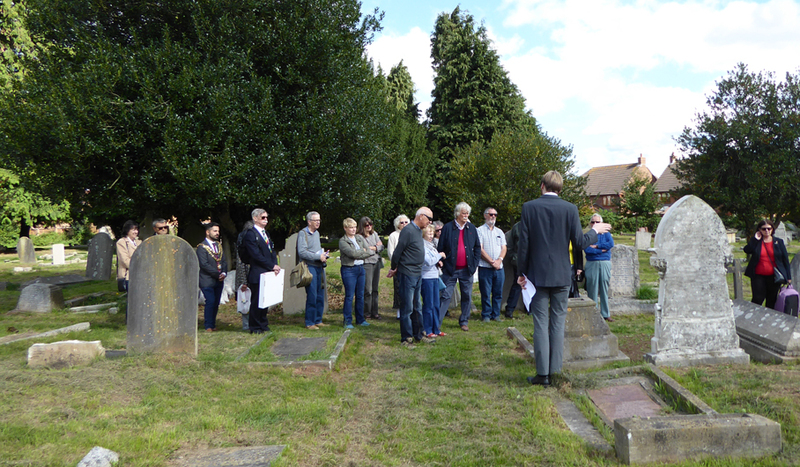 Part of the event involved a small tour taking in four memorials remembering Bridgwater servicemen, which the Friends had arranged to be repaired. These remembered Captain Arthur Major, Company Sergeant Major Richard Shrimpton, Second Lieutenant Frank Helps, Shrimpton and Naval Signaller Pursey Short. The work was funded by a combination of the Friends, voluntary donations from generous members of the public and a generous contribution from the Morgonians, representing old Dr Morgan's School (now Haygrove), which three out of the four soldiers had attended. 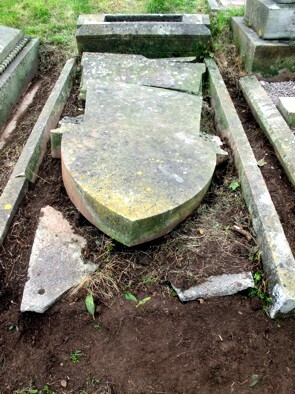 The work to repair these memorials was carried out by Fine Memorials of Bridgwater. Ian Hale, their director said 'we are pleased to be working alongside the Friends in repairing and maintaining Bridgwater's history. We feel this is a very important part of our past that needs to be maintained'. 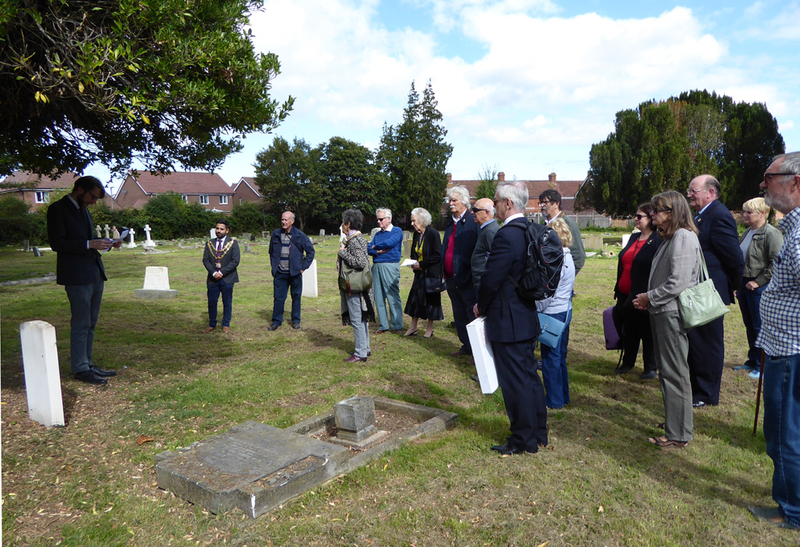 The tour finished at the unassuming grave of Charles Edward Bond, who died on 10 September 1918, one hundred years minus three days from the date of the commemoration. There are no markers on Charles' grave mentioning his service, or that he died because of the war. His story was only bought to light by Stephen Pope and the First Tank Crews Group who are researching all the tank crewmen of Autumn 1916 and Spring 1917. Charles served in the very first tank to cross the German front lines, on 15 September 1916 when tanks were used for the first time ever during the Battle of the Somme. 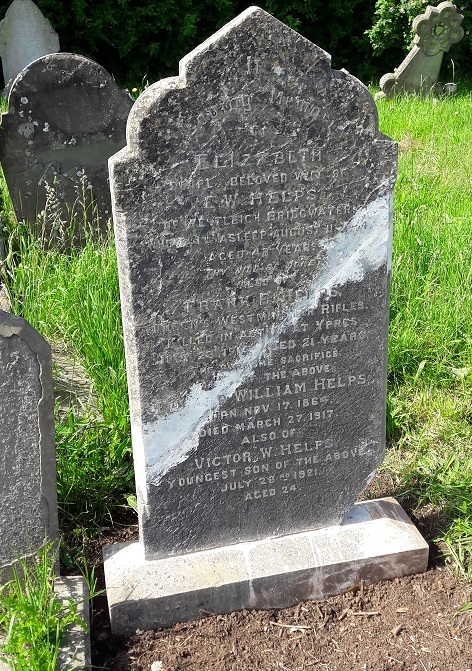 He left a very detailed account of the battle, which was printed in the Bridgwater Mercury, describing how he was wounded as his tank went into battle, how it was knocked out by artillery fire, how most of the crew were killed and how he remembers waking up in a hospital bed. 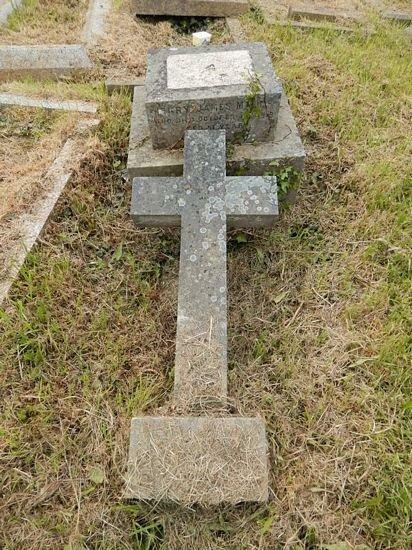 Charles Bond never recovered from the injuries and illnesses he developed at the front, and later died in his brother's house in Wembdon on 10 September 1918. 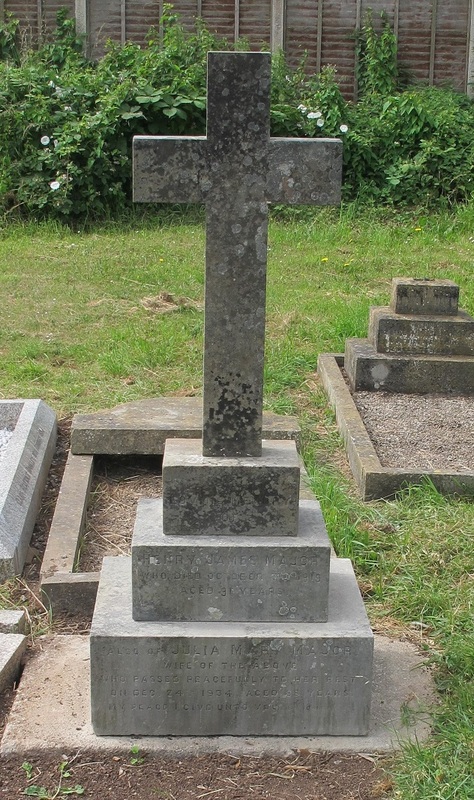 Although Charles' name appears on the town's war memorial, he is not amongst the Commonwealth War Grave Records because he died after he was discharged from the Army. 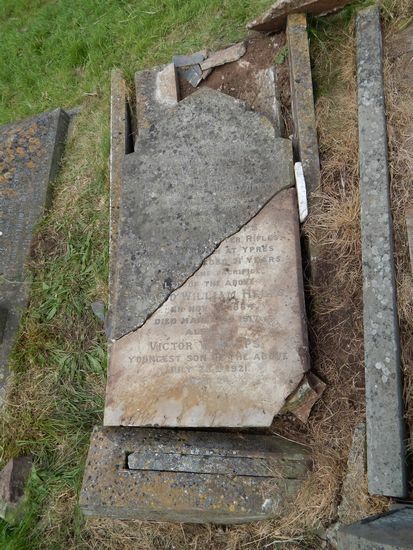 An application is being made to have Charles' death recorded and his grave properly marked. 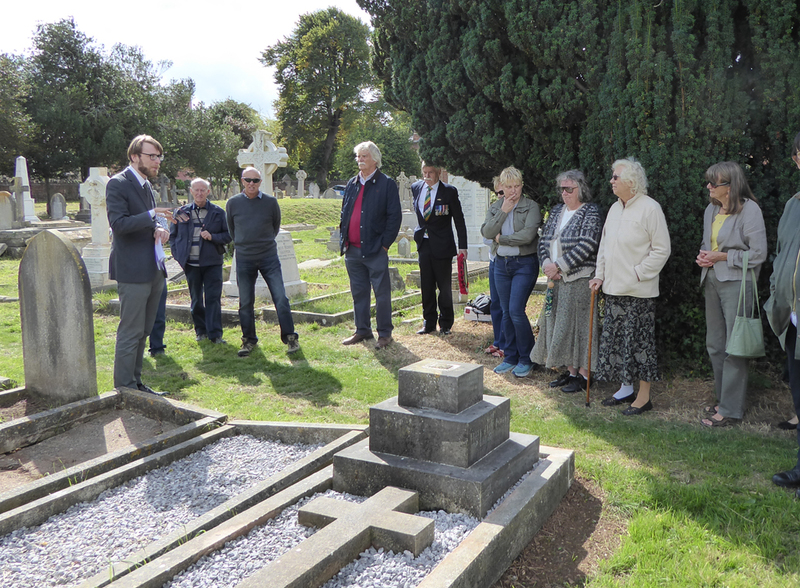 Stephen Pope, who is leading the effort, said "It is wonderful that Charles's grave, and all others buried in the cemetery, is being so well maintained by the Friends. It shows the respect with which our veterans should be treated in death." Stephen is keen to make contact with members of the local Bond family and relatives of Charles' sisters Florence Alexander and Grace Fisher, so that he learn more about Charles' life. 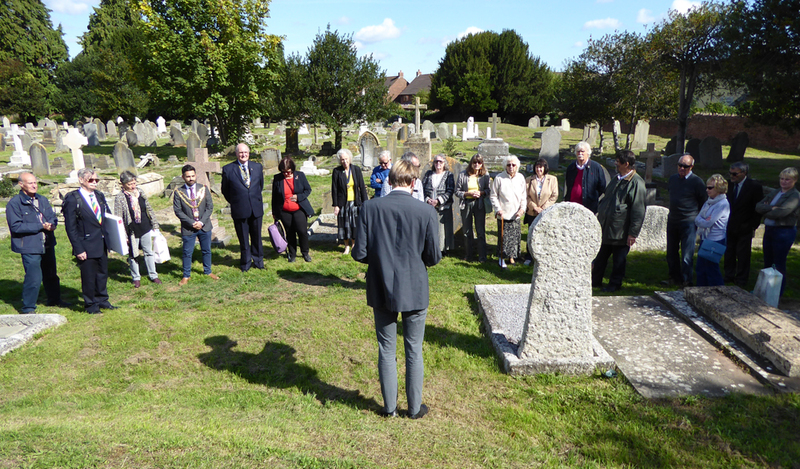 At Charles' grave a poem by Siegfried Sasson and a prayer of remembrance were offered up by Bernice Lashbrook, Lay Leader of Christchurch Unitarian Chapel of Dampiet Street. 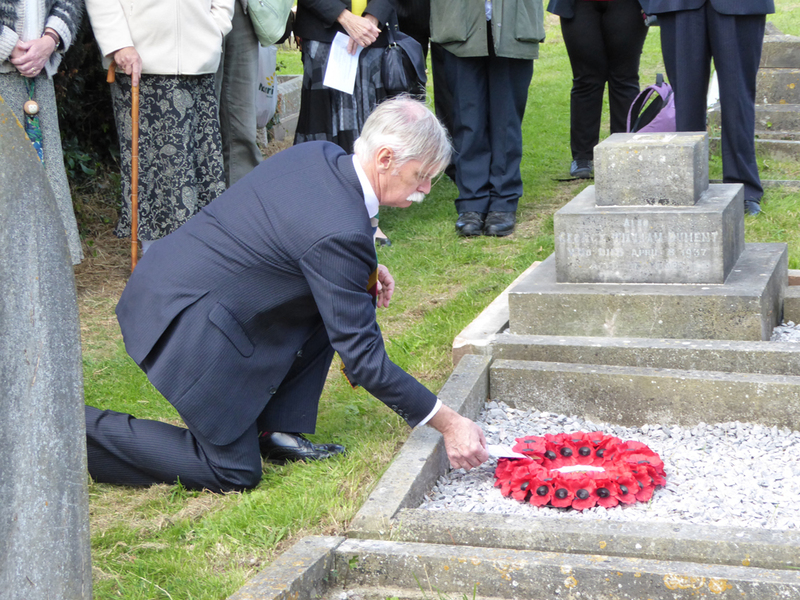 Then a wreath was laid on behalf of the First Tank Crews. 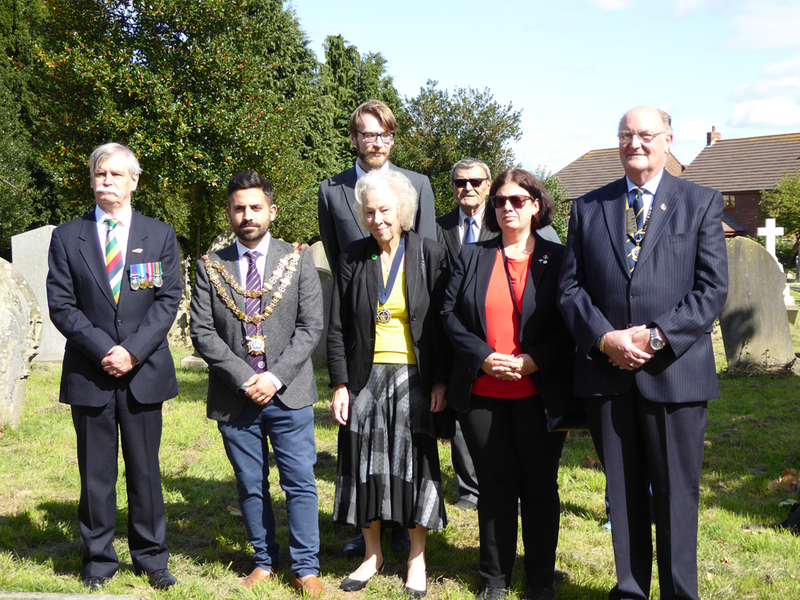 In attendance were the Mayor of Bridgwater, Diogo Rodriguez, Major Robert MacDonald, county chairman of the Somerset Royal British Legion, as well as representatives from the Morgonians, the Town Council, the District Council and the Friends of the cemetery. 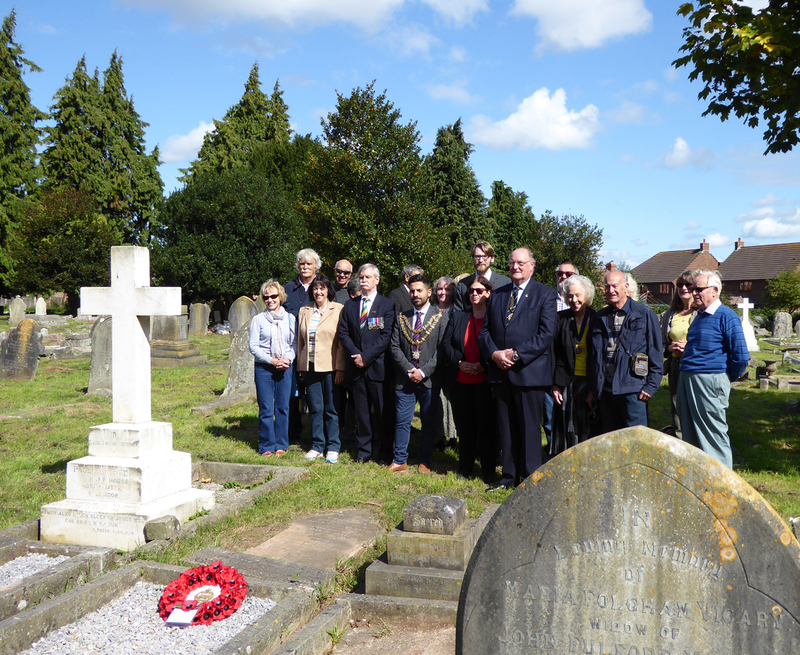 The tour started at the memorial of Colonel Thomas Foster Barham, a Bridgwater solicitor, who led the town's Local Defence Volunteers during the First World War. 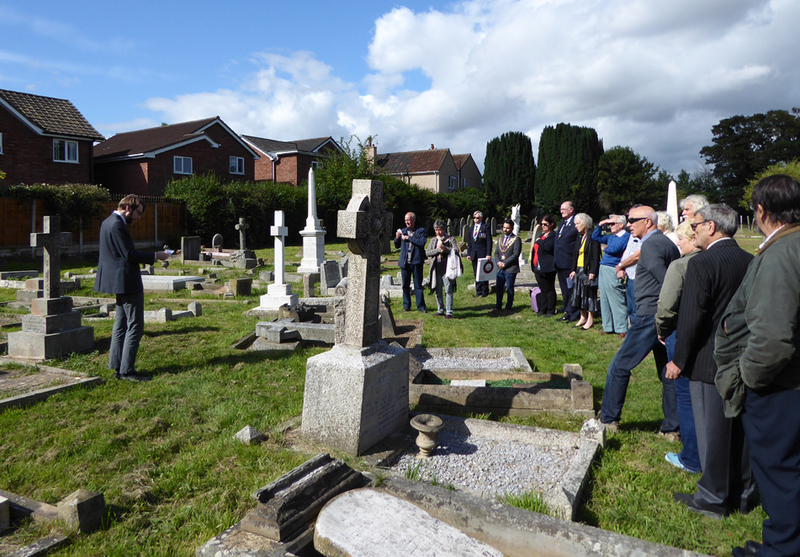 The tour moved onto the newly repaired memorials for Captain Arthur Major, who was killed leading his men at the Battle of Jersulam, and Frank Bovett Helps, who was killed on outpost duty. Roland Roberts (memorial on the left) was killed on 10 November 1918, just a day before the war ended. The memoral adjoining his (centre) remembers two brothers killed in the war, Clifford and Henry Redding. Henry was killed serving under Captain Major at the Battle of Jersulam. Pursey Short (memorial on the right of the picture) was a mariner, killed serving aboard a French steamship, which was torpedoed - see below for more details. The tour ended with the memorial to Gunner Charles Edward Bond, killed on the 10 September 1918 (a hundred years before this post). Although his memorial does not record his war service, Bond had served in one of the very first tank actions of the war. Bernice Lashbrook, of Bridgwater's Unitarian Congregation, read a poignant poem by Sasoon, before leading the group in a prayer of rememberance. A group photograph near Gunner Bond's memorial. 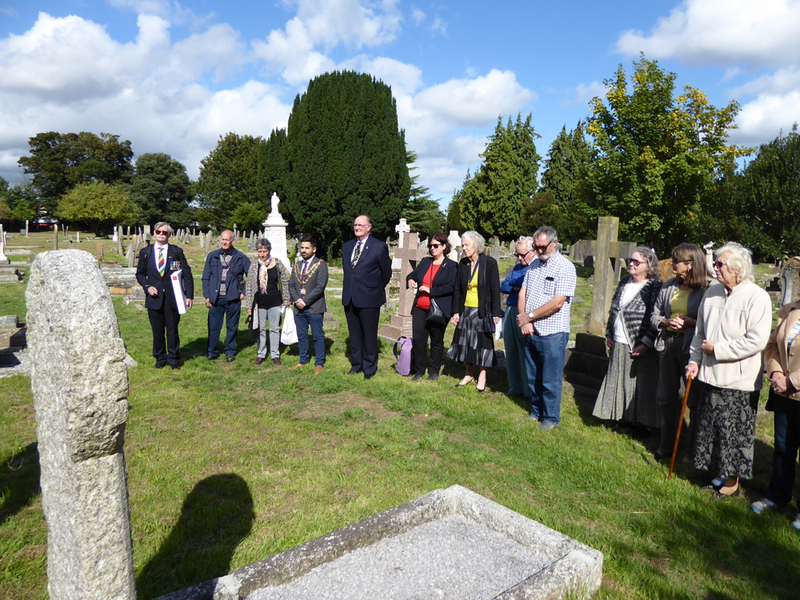 Stephen Pope, Principal Researcher of the First Tank Crews Project; Cllr Diogo Rodrigues, Mayor of Bridgwater; Dr Miles Kerr-Peterson, chairman of the Friends of the Wembdon Road Cemetery; Bernice Lashbrook, lay leader of Christchurch Unitarian Chapel; Cllr Mike Cresswell, attending in a personal capacity as his uncle Frederick Leigh was killed in the war and remembered in the cemetery; Kate Hurley, Membership Support Officer â€“ Somerset Royal British Legion; and Major Robert McDonald, County Chairman, Somerset Royal British Legion. Frank lived on Durleigh Road, attended Dr Morgan's School (now Haygrove) and trained as a draper. He enlisted in the signals corps in August 1915 and quickly rose through the ranks to become second lieutenant. 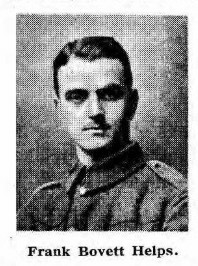 Frank was killed on 23 July 1915, while on outpost duty. This was less than a year after he enlisted. He was 21 years old. Arthur was the son of a brick and tile manufacturer. His family home was on Durleigh Road, across the road from the Horse and Jockey. He also attended Dr Morgan's and then joined his father's firm. He was killed in 1917 during the Battle for Jerusalem in November 1917. On 21st November the Wiltshire Regiment and the Somerset Light Infantry were ordered to attack and capture the fortified villages of El Jib and Bir Nebala. On 22nd November, they moved forward with a squadron of cavalry, the Somersets at the front of the attack under the command of Captain Major. The following morning they attacked El Jib, and immediately came under severe shrapnel and high explosive fire. The Somersets nevertheless moved forward under intense machine gun fire. Captain Oswald Major, who went forward with his company, was first wounded and then killed outright by shellfire. 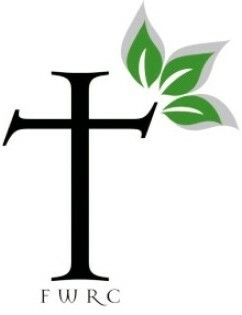 Small groups of his men reached the village, but all perished. His battalion lost 69 killed and over 400 wounded in the unsuccessful attack. Arthur was 42 when he died. Pursey was named after his mother's maiden name. He grew up in Taunton and worked as a cardboard box maker. He moved to Bridgwater to live with his aunt and was a scoutmaster in his spare time. Pursey served in the Royal Navy Volunteer Reserve and was killed aboard the French steamship, the S.S. Maine, where he was an interpreter. 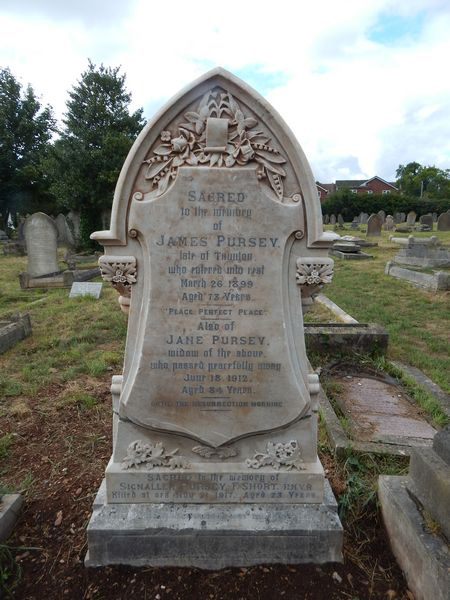 Pursey died when the ship was torpedoed and sunk by German U Boat 56 in English Channel on 28 November 1917. There was only one survivor from the entire crew. Richard grew up in Bridgwater, North Street, attended Dr Morgans, before moving to London to train as a draftsman. He emigrated to South Africa and then Australia in 1911. In 1915 he enlisted in the Australian Imperial Force. He was fatally wounded in June 1917 while serving in the trenches , during the Battle of Messines, dying soon afterwards.